A vibrant community enriched and supported by strong businesses. To champion business and build community in partnership with our members. Since 1954, MVLCC has been the premier business organization to represent both Lee and Mount Vernon districts in Fairfax County, Virginia. Today, more than 300 businesses belong to this organization. MVLCC has been a major player in several initiatives that have strengthened the vitality of the greater Richmond Highway Corridor. We have supported the BRAC moves to Fort Belvoir and worked to facilitate the selection of Fort Belvoir as home of the National Museum of the United States Army. We provide scholarships for students pursuing further education in a business field. We encourage local businesses and “shop local” initiatives. The Chamber sponsors a full program of activities for our members including business breakfasts and after-hours networking. 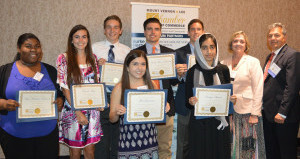 Business awards, the Chamber Scholarship Golf Tournament, scholarships for local high school students, and recognition for public safety officers are all part of the Chamber’s annual program. The Mount Vernon-Lee Chamber of Commerce has consistently been recognized as one of the largest Chambers in the metropolitan area. Meet the members that provide the vision and leadership for the chamber of commerce. The Board of Directors consists of five officers and fifteen Directors. Join a Chamber committee and work with other members to promote pro-business policies in all levels of government, plan events, organize the annual golf tournament, and more. The Education Partnership is a 501(c)(3) entity that furthers educational opportunities for students in Mount Vernon and Lee Districts by providing scholarships to graduating high school seniors.